"Create a railway for your train in this platformer"
The product presented here is called Badass Locomotive. It’s a platform video game in which your train will have to catch all the bonuses. Elsewhere on Winportal you can find a wide range of games and puzzles as well as platformers are well represented categories. Now, this one is a rather fun game you might be interested in as well, developed in the context of an international event annex challenge, Badass Locomotive has been awarded a prize and now you can download it here. 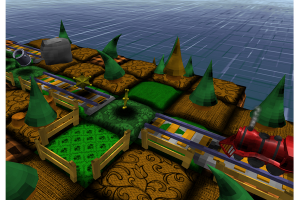 In Badass Locomotive you’ll have to create a railway. You’ll encounter a variety of items on your way, but the trail must continue and reach the end point indicated by the red arrow. Each piece of the railway will have to be added faster as the time moves on and to avoid the train from derailing. So, roll up your sleeves and be ready for some challenging fun.